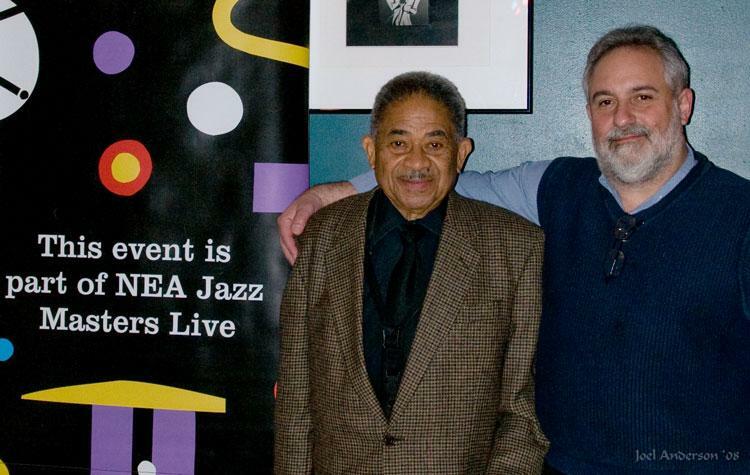 Jon Poses at right with Frank Wess, a National Endowment for the Arts Jazz Master who played at Murry's in Columbia recently passed away at age 91. Poses was recently named a Jazz Hero. The award from the Jazz Journalists' Association will be presented at 5:00 p.m. today at the We Always Swing Jazz Series office in Columbia. advocates, altruists, aiders and abettors of jazz who have had significant impact in their local communities. The 'Jazz Hero' awards, made annually on the basis of nominations from community members, are presented in conjunction with the JJA's annual Jazz Awards honoring significant achievements in jazz music and journalism and with the month-long celebration of jazz. That month-long celebration takes place each April. Locally, the We Always Swing Jazz Series celebrates the conclusion of Smithsonian co-sponsored Jazz Appreciation Month today. During April the Jazz Series hosted fifteen events including jazz concerts, public events, a film and talks on jazz. JazzApril concludes tomorrow with an open house at the Jazz Series' offices. It is at that open house that Jon Poses will accept on behalf of his organization his 'Jazz Hero' award. In a recent KBIA interview, Poses talked about how he came to Columbia to get a degree then move on. While in Journalism School, Poses continued to write about the jazz he had grown up loving and seeking out while in Queens, New York. Recognized for his jazz journalism in publications such as the venerable jazz monthly Downbeat, Poses was soon being asked by bands he was writing about to help them find venues in the Midwest. In time, he had a business booking acts across the United States. To bring jazz to Columbia, Poses created The We Always Swing Jazz Series, which will launch its 20th season this August. Poses is an associate member of the Jazz Journalists Association. Listen here to We Always Swing Jazz Series Executive Director Jon Poses recalling the early years of the series. The We Always Swing Jazz Series hosts an open house on International Jazz Day today from 1:00 until 8:00 p.m. at their offices located at 21 South Tenth Street in Downtown Columbia. Jon Poses will accept his Jazz Hero award from the Jazz Journalists Association at 5:00 p.m. Listen for the sounds of Mid-Missouri's local colors each Tuesday at 6:30 p.m. on KBIA's Thinking Out Loud.